Although few surviving written Quatrian records have been dated prior to the Pantarctican Diaspora, oral tradition records a deep-rooted (pun intended) veneration within Quatrian lore for a plant which we, in modern times, spend millions of dollars each year to eradicate. I’m referring, of course, to the humble dandelion. Although most modern gardeners and homeowners prefer to pour poison on this most gregarious of “weeds,” the value of the dandelion has long been known within culinary and medical circles. Indeed, its very scientific name (Taraxacum officinale) indicates that it was considered so important to Medieval monks that it was regularly stocked in their apothecaries. To be clear, we aren’t 100% certain that the plant referred to in Quatrian tradition as a “dandelion” is exactly the same as our Taraxacum. 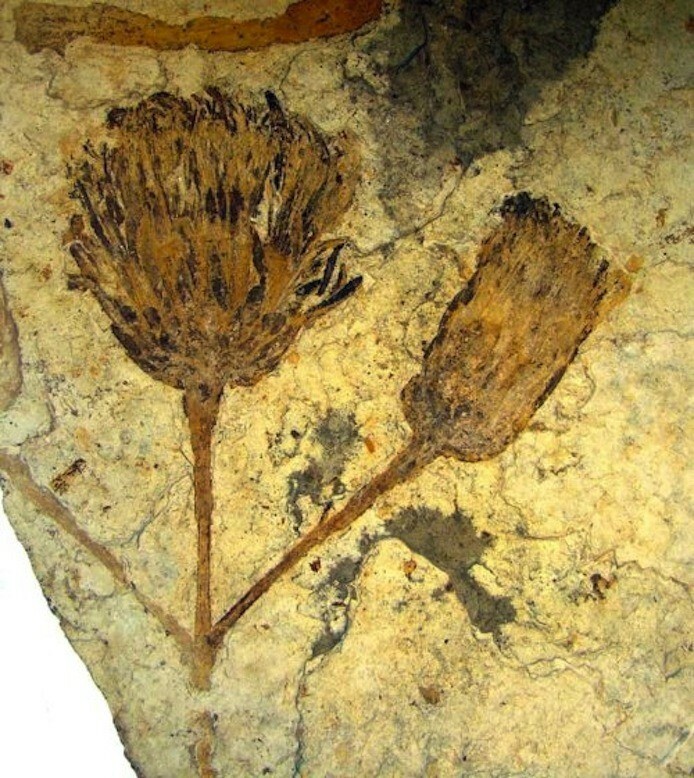 Given that fossilized ray-flowers of the dandelion “type” have been found dating back approximately 45 million years (see link in photo caption above), it’s entirely possible that the extant species during the Quatrian era was something more similar to what we know as chicory (Cichorium intybus) — a theory which may be borne out by the world for dandelion in Quatrian-related languages like Basque (txikoria) and Maltese (ċikwejra). However, given the description of the plant found in Fragment XI of the 10th C. BCA “Lay of the Quatrian Knights,” as well as the use of Taraxacum spp. in modern Pantartican herbal preparations, we can be forgiven for using “dandelion” to describe the herb in question. Indeed, the text of Fragment XI, although undoubtedly influenced by the culture in which it was composed, even refers to “…the realm of tiger-toothed leaves” (1). As is likely well-known to most readers, the Norse myths tell of a great ash-tree, Yggdrasil — the axis mundi upon which the various worlds depend. The Quatrians had a similar, but markedly different, view of the dandelion. The World-Herb, or “Buorth” in Old Quatrian, illustrated the composition of “reality” based upon a pre-shamanic ontology. 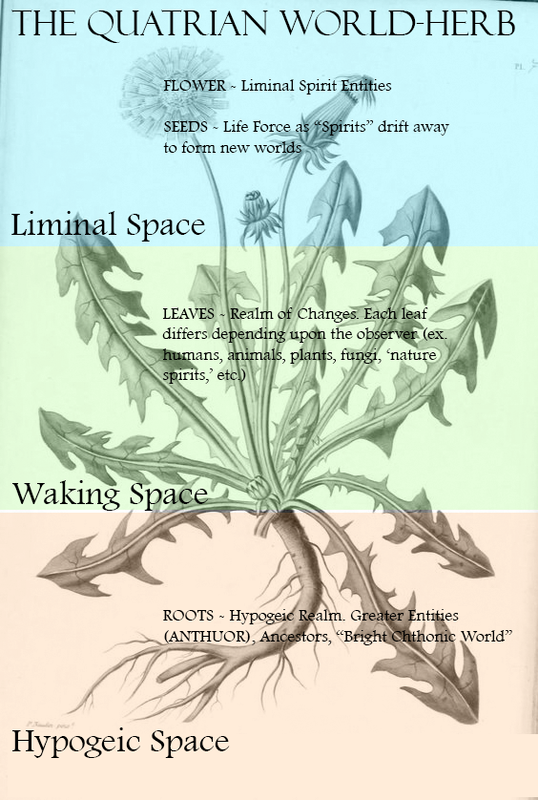 Although three “realms” are represented upon the Buorthian dandelion, the tradition holds that all of these realms are occurring simultaneously (just as all parts of the dandelion are “alive” at the same time), and are accessible to every entity without the need for entering an “altered state” or otherwise depending upon an intermediary. 1 — Hypogeic Space: This is the root, the realm of the Hypogeum, wherein Anthuor and the Ancestral Spirits reside in a “Bright Chthonic World.” The Buorth receives sustenance from the Life Force — the soil surrounding the root, which reaches into the depths of the soil, the Womb Underneath. Having a fairly robust microcosm close at hand almost everywhere gave rise to a number of cultural practices, many of which remain important. The dandelion’s very prolific nature enhanced its sacredness; the Quatrian “seeker” always had an example of her worldview close at hand. In fact, she could even choose to grow an entire “new world” in her garden or yard. The very concept of “invasive species” would have been abhorrent to the average Quatrian; their globe-spanning civilization didn’t view any entity — plant, animal, or fellow human — as external to the system of values they professed. In some areas, pulling up dandelions prematurely, instead of harvesting them to use, was considered socially offensive — individuals caught doing so were labelled “small-world-destroyers” and risked being uninvited to the best parties. Quatrian herbalists used the different parts of the dandelion to remedy illnesses in corresponding parts of the body: flowers for the head, leaves for the torso/upper organs, and roots for the lower organs. Interestingly, this practice was carried out long after the Pantarctican Diaspora, and can still be found in modern herbalism. Dried dandelion roots were carried by adherents of Anthuor as a kind of apotropaic charm, and used to invoke the Hypogeic powers. Dandelion flower-heads were ritually consumed by those seeking communion with Liminal Spirits. A drink containing dandelion latex (the milky white substance exuded from the fresh plant) was offered to the spirits. Some believe that this practice has echoes in the Indo-European tradition of leaving milk out for house-spirits or fairies. Offering guests a salad containing dandelion leaves was a sign of great esteem. An entire tome, or even a grimoire, could be composed based entirely upon the Quatrian view of the dandelion. Quatrian or not, the author hopes you’ll take pause the next time you see one of these ubiquitous plants in your garden or lawn, and appreciate it in the way of Ancient Quatria. You can have the whole world in your hands! It was the author’s intent to quote a large portion of the Quatrian fragment in question. However, due to a proprietary issue, Tri-Cities University is withholding publication of the full English translation of “The Lay of the Quatrian Knights” at this time. Baker, R.B .“The Quatrian Mysteries of Actaeon: A Closer Reading.” Luminos: The Journal of Creative Mythology. Vol. II, №12. Philodendron Press, 2015.